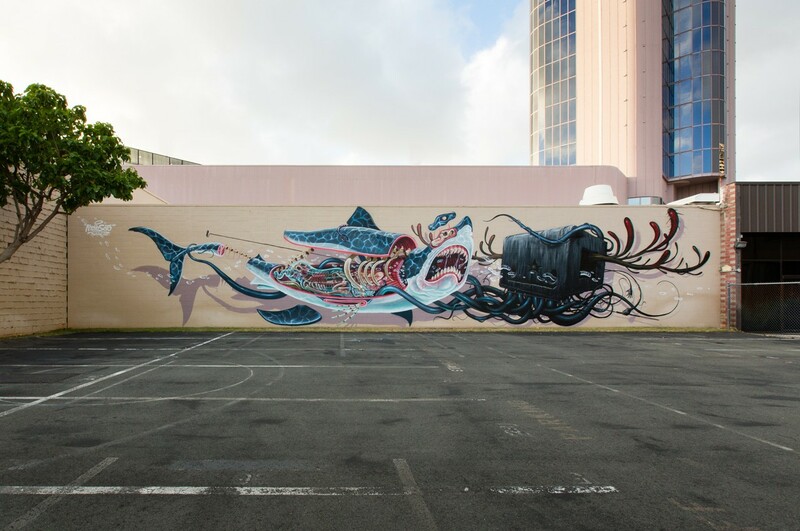 Nychos and Jeff Soto are acclaimed artist from Austria and Los Angeles respectively. They are renown for their brightly colored illustrative work that adorns walls and canvases all over the world. The concept of the painting stems from Nychos’ interest in medical illustrations. The shark isn’t being butchered or killed, rather it is being carefully studied for its anatomical structure by a fantastical mythological creature by Jeff Soto. The squid-like creature has an affinity for anatomy and art, hence the paint roller that it is carrying (a common art tool for street artists). Their main goal is to share the beauty of the shark (both inside and out) to his race through art. Upon studying the shark, he realizes that it is the perfect place to lay his fellow human artist friend to rest. In that respect, his friend will forever swim freely in the oceans of the world.